Bad news for iPhone 4 and iPhone 3GS owners, as it's been revealed that several new features on Apple's iOS 6 platform won't be available on the handsets. Apple launched iOS 6 this week, showing off a whole variety of new features, including a brand new mapping system, ditching Google Maps in the process, as well as the ability to Facetime over cellular networks and not just Wi-Fi. However it's now come to light that the iPhone 4S is the only mobile which will benefit from all new features. Free turn-by-turn navigation has been a cornerstone of Google's Android operating system for years and Apple has now caught up with its own, TomTom powered, offering. 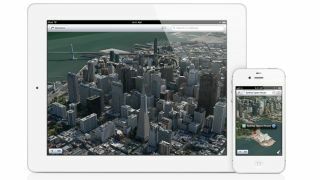 However it, along with the fancy 3D flyover functionality, will only work on the iPhone 4S, with previous handsets not getting the functionality – although it will be available on both the iPad 2 and new iPad 3, as it seems an A5 chip is the necessary element for all these features. Facetime is currently compatible on both the iPhone 4 and 4S as well as the iPad 2 and new iPad 3, but a statement on Apple's website reads: "FaceTime over a cellular network requires iPhone 4S or iPad (3rd generation) with cellular data capability." We were surprised to learn that Apple was providing the iPhone 3GS with the iOS update, but it's now apparent the Cupertino-based firm is giving a clear advantage to its latest products – probably in the hope that users will ditch their older handsets and fork out for the new shiny, expensive ones.